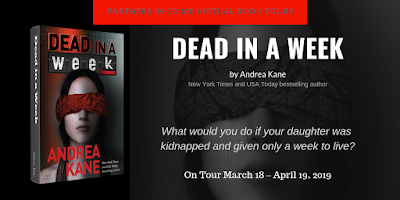 Welcome to Freda's Voice tour stop for Andrea Kane's new book, Dead In A Week. Keep reading to the end, there is a guest post by the author. I often get asked what irritates me most when I’m writing. In pondering that question, what occurred to me is that some of those things are specific to my writing and some are the same things that irritate me when I’m reading. Let’s start with the writing quirks. Number one on my list: I need dead silence when I’m writing. No music. No distant conversations. No “quick questions” or interruptions. Nothing. Believe me, I know how tough that is to accomplish. That’s why, during my writing hours, I pretty much hole up in my office, door tightly shut, and avoid emails, social media, and phone calls. I write from early in the morning until early afternoon, after which I rejoin civilization, follow up on what I need to, and spend time with my family (and remember that I haven’t eaten since the night before). I have a precious one-year-old granddaughter and a demanding little Pomeranian, both of whom I adore playing with. I wouldn’t give up that time for anything. So, much of the afternoon is devoted to them, to household responsibilities (yuck! ), and to taking a long walk to get in my 10,000+ Fitbit steps. I resume writing in the evenings and sometimes continue until way too late at night. It’s a good thing I don’t need much sleep, because I never get it! And the obvious #2 on my writing quirks: getting stuck. And I don’t mean a little stuck. I mean when not only won’t the words flow, the tight connection I have to my characters and my storyline isn’t there. It’s like I’m floating and I just can’t seem to swim. Those days I turn to researching and rereading my previous chapters to boost myself back into the saddle. But it’s more frustrating and upsetting than I can say. Now for the writer/reader combo irritations. Number one: misunderstandings. I absolutely hate when a simple misunderstanding is the pivot of a story. Every time I find myself even remotely going in that direction, I veer rapidly off. And as a reader, I’ve been known to not finish a book once I realized that a misheard word or a letter that never arrived serves as the story’s foundation. It’s a major pet peeve of mine, one I’ve had forever. Next up, flimsy storylines. Now granted, some of that is because I can never seem to write anything simple. No matter how hard I try, every novel I write is super complex and multi-layered. It’s just in my DNA. So it’s natural that it’s also in my reader DNA. If I finish a book and my reaction is: “That’s it?? ?” then there’s a big problem. I never allow myself to do that to my readers, and I get very cranky when an author does that to me. And last, I love sequels and/or series books. That goes without saying, since DEAD IN A WEEK is the 7th in the Forensic Instincts series and I’ve already started on the 8th. The one thing I strongly dislike is finishing a book with the understanding that, if I want to find out what happens next, I must wait for the sequel. In my opinion, every book should be a complete story unto itself. Spinning elements of it into the next book is great, but leaving me hanging after the last page just isn’t okay. Despite the fact that I’ve just expounded on the negatives of writing and reading, I love both and truly can’t imagine doing anything other than writing. It’s who I am, and I feel blessed to be able to create my stories and share them all with you. I can’t wait to hear your reactions to DEAD IN A WEEK! 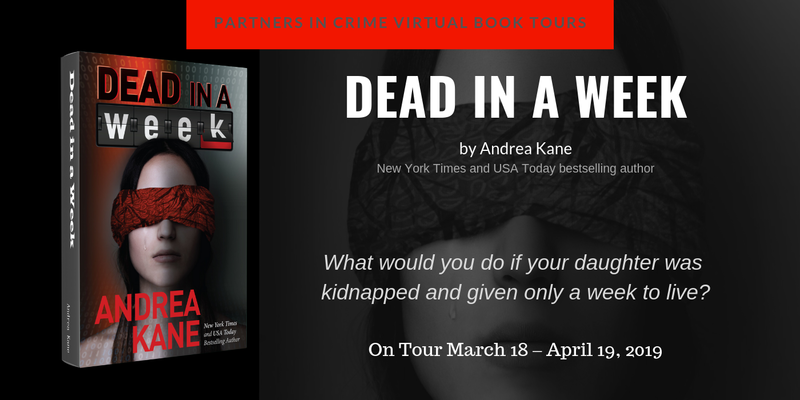 Thank you all for visiting our guest author this week, and I hope you will get your copy of Dead In A Week today! I hope you get to read this book.....it was a page turner! 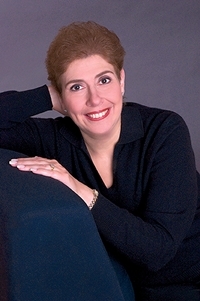 I love Andrea!!! It is so interesting to learn more about her. Oh wow. That's terrible to be snatched off the street. The book sounds great! This was a great post to do-- it gave me the chance to air some of my reading and writing gripes! Many thanks for including me and showcasing Dead in a Week!